My fry oil always seems dirty. What am I doing wrong? There are a number of things you can do to keep oil fresh. A main factor in oil getting dirty is improperly shaken freshly breaded foods. For example, if you dust calamari or chicken in flour immediately before frying and dump the pieces in the basket without shaking well, the excess flour falls off the food, clouds the oil, cooks, and eventually burns, flavoring the oil with unpleasant bitterness and causing rancidity. Shaking thoroughly helps prevent this problem, as does not overcrowding the fryer. Frying fatty foods like chicken wings can also contribute to oil breaking down—the fat in the food mixes with your good frying oil. 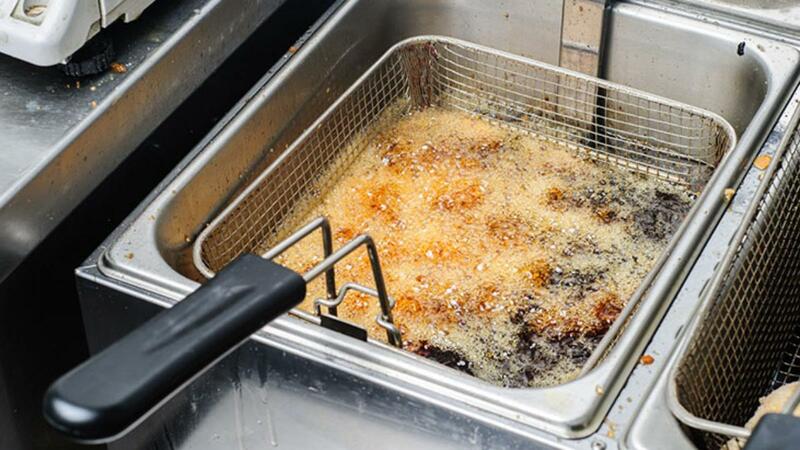 Be careful to skim out food particles floating in the oil and especially those that may sink to the heating element or stick to the sides of the fryer. Keep the temperature low (below 375 degrees F) and keep the fryer off, covered and cool when not in use. More on keeping frying oil working well here and here.